The writing of this preliminary chapter, and the final survey and revision of my Whitman essay, I am making at a rustic house I have built at a wild place a mile or more from my home upon the river. I call this place Whitman Land, because in many ways it is typical of my poet,—an amphitheatre of precipitous rock, slightly veiled with a delicate growth of verdure, enclosing a few acres of prairie-like land, once the site of an ancient lake, now a garden of unknown depth and fertility. Elemental ruggedness, savageness, and grandeur, combined with wonderful tenderness, modernness, and geniality. There rise the gray scarred cliffs, crowned here and there with a dead hemlock or pine, where, morning after morning, I have seen the bald-eagle perch, and here at their feet this level area of tender humus, with three perennial springs of delicious cold water flowing in its margin; a huge granite bowl filled with the elements and potencies of life. The scene has a strange fascination for me, and holds me here day after day. From the highest point of rocks I can overlook a long stretch of the river and of the farming country beyond; I can hear owls hoot, hawks scream, and roosters crow. Birds of the garden and orchard meet birds of the forest upon the shaggy cedar posts that uphold my porch. At dusk the call of the whippoorwill mingles with the chorus of the pickerel frogs, and in the morning I hear through the robins' cheerful burst the sombre plaint of the mourning-dove. When I tire of my manuscript, I walk in the woods, or climb the rocks, or help the men clear up the ground, piling and burning the stumps and rubbish. This scene and situation, so primitive and secluded, yet so touched with and adapted to civilization, responding to the moods of both sides of the life and imagination of a modern man, seems, I repeat, typical in many ways of my poet, and is a veritable Whitman land. 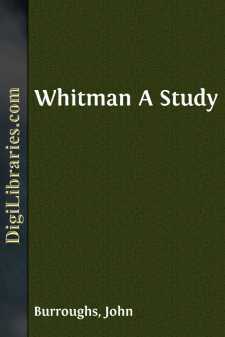 Whitman does not to me suggest the wild and unkempt as he seems to do to many; he suggests the cosmic and the elemental, and this is one of the dominant thoughts that run through my dissertation. Scenes of power and savagery in nature were more welcome to him, probably more stimulating to him, than the scenes of the pretty and placid, and he cherished the hope that he had put into his "Leaves" some of the tonic and fortifying quality of Nature in her more grand and primitive aspects. His wildness is only the wildness of the great primary forces from which we draw our health and strength. Underneath all his unloosedness, or free launching forth of himself, is the sanity and repose of nature.